Dyspraxia is generally recognised to be an impairment or immaturity of the organisation of movement. Developmental Co-ordination Disorder (DCD) is another term to describe Dyspraxia. The term Dyspraxia comes from the word praxis which means 'doing, acting'. Introductory Brain Highways video on the effects of poor sensory integration, particularly proprioception. A short film made by the Dyspraxia Foundation Newbridge Outreach can provide free training related to Dyspraxia Please contact us if you are interested. 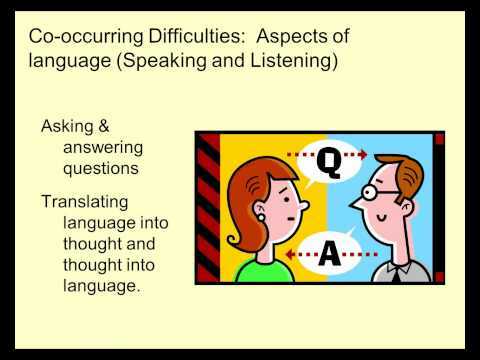 In this webinar, Glenys Heap, Dyslexia Action's Director of CPD discusses the key issues related to learning difficulties frequently co-occurring with dyslexia such as dyspraxia, ADHD, etc. If you are unsure how to support students with Dyspraxia, this link takes you to a summary advice sheet prepared by The Dyspraxia Foundation. A simple clear illustration - maybe useful to print out and put in SEN room. 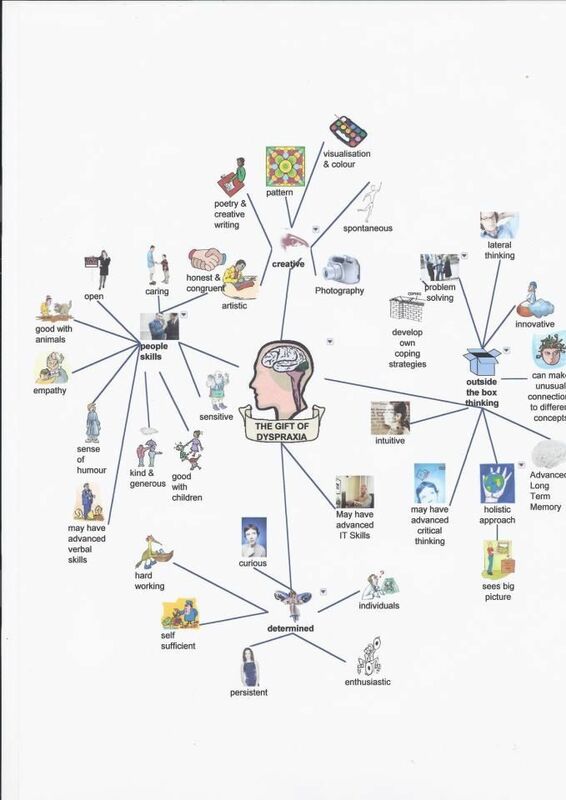 This is a simple visual image showing the acknowledged positive aspects of Dyspraxia. How can I identify Dyspraxia in primary aged children? The Dyspraxia Foundation have summary advice sheets that are free to download. How can I help a Secondary aged pupil with Dyspraxia? The Dyspraxia Foundation has specific advice relating to strategies to use in school. This link provides specific advice for teenagers for home or school. Can my child have Autism and Dyspraxia? Motor coordination difficulties are often observed in children with Asperger's Syndrome. Both Autism and Dyspraxia are conditions on a spectrum and there is a high rate of overlap. What are the key facts teachers need to know? This link takes you to a one page summary of key facts teachers need to know. Current research suggests that it is due to an immaturity of neurone development in the brain rather than to brain damage. How can I help teenagers who have Dyspraxia? Here you can found very specific advice relating to teenagers. Where can I find out about Dyspraxia in adults? Has a great checklist of areas adults may find more difficult. DANDA promotes and support adults who have Neurodiversity as part of their profile. 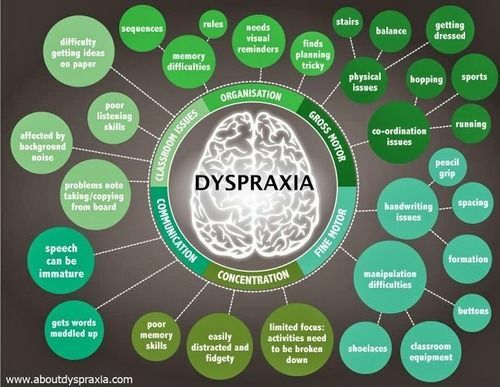 Some useful information here about Dyspraxia in Further Education / Work. Where can I find information about Dypraxia and PE? Has a great set of succinct advice for both primary and secondary schools. How many people have Dyspraxia? Dyspraxia is believed to affect 8% to 10% of the population to some degree and 2 % severely. The Dyspraxia Foundation is a country Wide charity, founded in 1987 as the Dyspraxia Trust by two mothers who met at Great Ormond Street Hospital for Sick Children. The Dyspraxia Foundation, is based in Hitchin. They answer approximately 10,000 enquiries and distributes more then 20,000 leaflets about the condition each year. The Foundation seeks every opportunity to increase understanding of Dyspraxia. The website is very informative and is a great source of information for parents, teachers and young pupil. DANDA – the Developmental Adult Neuro-Diversity Association has been set up for people with Dyspraxia, Asperger’s Syndrome, AD(H)D and other related conditions such as dyslexia and dyscalculia. Links to local groups that provide horse riding opportunities for your child, from simply stroking a horse to having proper riding lessons. Newbridge Outreach Service provides support to pupils with a range of learning, medical and physical difficulties. difficulties with handwriting and alternative forms of recording. Request for support should come from the school the pupil is attending or another Agency involved. The Occupational Therapy Team are now based at Redbridge Child Development Centre (0 -19yrs), previously known as The Kenwood Centre in Barkingside. Students they support: The Early Years Advisory and Support Service (EYASS) support children with complex special needs within their school nursery or reception class. How can pupils get referred to this service ? Pupils must be referred to this service from the Pre School Liaison Group via the Educational Psychology Service.